Product #20559 | SKU 12091 | 0.0 (no ratings yet) Thanks for your rating! 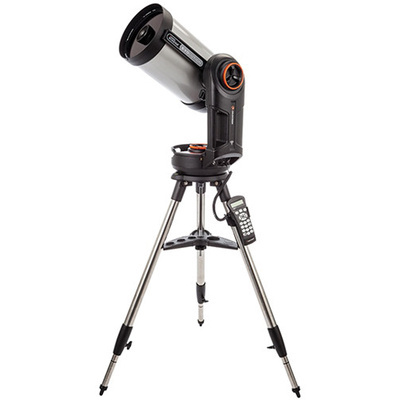 The NexStar Evolution 8" Schmidt-Cassegrain Telescope from Celestron is a powerful, versatile and user-friendly Schmidt-Cassegrain style telescope that can be used for observing everything from the Moon and planets to deep sky objects like galaxies and nebulae. Using Celestron's improved proprietary StarBright XLT multi-coating system, light transmission is increased throughout the entire optical path with anti-reflection multicoated lenses, highly reflective multicoated mirrors, and 4-element rare-earth glass. While the focal ratio is a slow f/10, the scope's precision tracking system allows it to be a competent astrophotography/astroimaging platform for the Moon and planets. Designed for portability, the Evolution features a long life lithium-ion phosphate battery providing up to 10 hours of continual use on a single charge. The scope comes with an AC power supply with plugs for the US, EU, UK, and AU outlets. The battery powers the servo motors, auxiliary accessory ports, a USB charging port, and the built-in Wifi. Manual clutches in both altitude and azimuth enable users to manually move and point the telescope when it's powered off.